Hotel El Cau del Papibou is a significant place to stay in Peratallada; a location which will allow you to enjoy yourselves in peaceful surroundings and take away biding memories for ever. Peratallada is one of the best preserved medieval settings in the peninsula and was declared an historic-artistic heritage. Hotel Restaurant El Cau del Papibou is situated in an old 12th century building. It’s a charming Hotel, recently renovated in a unique fashion, presenting modern personalised rooms which offer you all the commodities you wish for. 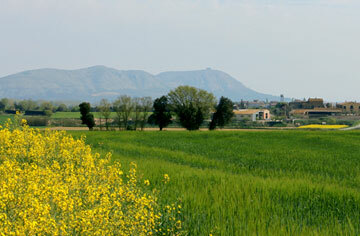 Hotel El Cau del Papibou is a unique spot to relive its history in the heart of l’Empordà. Go up to your room where you can see the heart of the Empordà, enjoy the 32” TV or check your emails via our Wi-Fi network. Go and have a drink in our restaurant’s inside ground, relax in our reading room or take a walk amongst the old stone paved streets before going to dinner. Perhaps you would like to have breakfast with locally produced cold sausages and toasted bread or others options from our buffet, or try the dinner served at a table placed over the vat where wine was originally pressed in the old kitchen. All these possibilities are presented by the Hotel el Cau del Papibou in Peratallada. 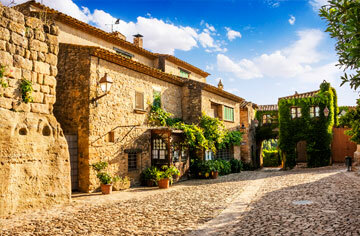 Probably one of the most enchanting medieval villages on the Costa Brava. Discover this Jewel of a village. The “Baix Empordà”, specially the “Empordanet” or heart of l’Empordà, brings together idyllic landscapes which will capture you forever. 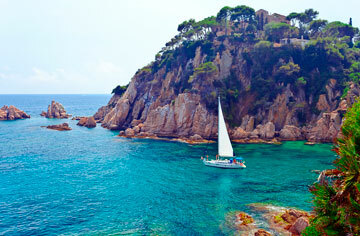 The Costa Brava’s beauty, combines rugged scenery with tranquil countryside.